Alright France you win. You have the best black metal. 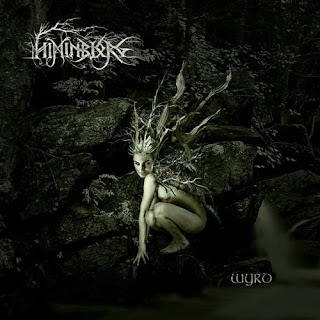 Here we have Himinbjorg with their seventh full length release entitled, “Wyrd”. The main focus of the music is black metal with strong Viking metal influences with melodies and vocal styling. They have lyrical themes of Scandinavian Mythology and Viking wars. Nothing is more soothing than the refreshing sound of running water in the midst of nature. This is the imagery created from the intro to “Wyrd”. Although this is abruptly halted by the animalistic beckoning of man. “The Sword of Dignity”, this is an awesome drawn out track. It’s not over saturated with lead harmonies. There is a nice blend of clean vocals as well. The clean vocals definitely make the music stand out more and another dimension to the already great sound of Himinbjorg. “The World of Men Without Virtue”, is a great progressive track with amazing harmonies. This song also has a mesmerizing clean section with a fantastic solo. “Initiation”, has a more traditional black metal feel to it. They also incorporate killer double bass and a sweet folk metal solo. “The Mirror of Suffering”, starts off with a clean intro but becomes very driving with all the double bass. The folk instrument they use on this record is extremely well placed within the mix and doesn’t over power the guitars. I’m unsure how much Middle Eastern music has influenced Viking and or Folk music but to me I hear that type of influence deep seated in the cadences here on “Wyrd”. “The Eternal Light”, stands out stylistically because it’s the slowest track out of the record. It has more of a melodic death metal feel to it, due to the slow groove with melody and the deep growling vocals. This track somewhat reminds me of Moonspell. Over all this is an extremely solid release for the black metal encyclopedia. It’s nice to have some black meta that is more focused on nature and other universal subjects. The main thing that stood out to me with this record was how well Himinbjorg use the Folk and or Viking aspect to their sound. They infuse it so well as to not overpower the great black metal song writing movements. Himinbjorg should be playing metal festivals if they aren’t already.